Like other forms of insurance, life & health insurance is about transferring risk away from you to the insurance company. 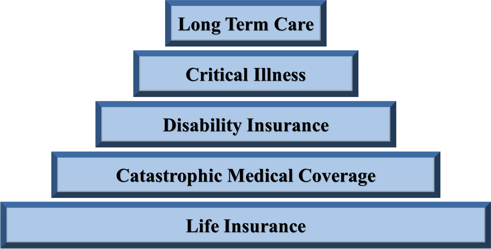 Your financial plan would not be complete without a careful examination of your life and health insurance needs. For a relatively small premium, the insurance company will take on the financial risk that something might happen to your life or health or that of your loved ones. I don’t believe in trying to pressure anyone into buying insurance with scare tactics, but I do believe in asking the tough questions to help clients consider what their life or health insurance needs really are. There are few things worse than speaking to someone who had a tragedy happen without the adequate insurance. What would happen if you or your partner passed away? Who would pay your mortgage or care for your children? What about if you had a prolonged illness and could not work for an extended period of time? What if you get diagnosed with a condition that not only stops you from working, but also has expensive treatments? These are uncomfortable questions but are important to consider. It’s important to review these questions with a professional who can help you determine what is necessary and affordable for you. You don’t want more insurance than you need because you’re wasting your money, however you also don’t want less insurance than you need in the event that you do need to use the coverage.